An anonymous whistleblower, who claims to be part of the “senior management team at Deloitte, Haskins and Sells LLP (Deloitte)” and has been “privy to several internal irregularities in providing professional services to the IL&FS (Infrastructure Leasing & Financial Services) group” has written to us outlining how the audit firm benefited by helping the failed group fudge its accounts year after year. In fact, Deloitte ensured a clean chit to IL&FS even when the Reserve Bank of India (RBI) claims to have red flagged a few issues and asked it to reduce its outstanding debt. It is another matter that IL&FS did nothing. The whistleblower says, “The extent of the scam is mind boggling” and hopes that investigation agencies would question members of the audit team, thereby giving him a chance to disclose how the “the senior management at Deloitte is aware of the financial mismanagement and impropriety by the IL&FS group” and actively helped fudge facts. 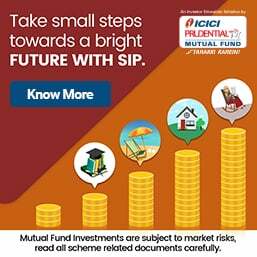 Deloitte has an internal reporting system; but the whistleblower says, “I have no faith in the current leadership and, hence, am consciously not resorting to our internal whistle-blowing mechanism.” He goes on to provide a few details which need to be understood in the context of what we already know about its relationship with IL&FS. Deloitte has audited IL&FS Financial Services Ltd (IFIN) for 10 years and remained the auditor until it completed 10 years in 2018. The audit report had absolutely no adverse findings even in 2017-18. On 3rd April, the new IL&FS management headed by banker Uday Kotak said that 90% of the loans advanced by IFIN, the lending arm of IL&FS, had turned bad. 1. Deloitte was a beneficiary of IL&FS’s ‘unmitigated growth’ over the decade in multiple ways. It enjoyed a ‘preferred advisor role’ and was awarded several advisory contracts on a ‘single sourced basis’ at ‘substantially high fees’ as compensation. 2. When audit findings would not show IL&FS in a ‘favourable light’ and Deloitte had to take a position, the auditor conveniently relied on “management explanations and comfort letters by compromising on its independent opinion.” At times, IL&FS’s top management would meet and “coerce Deloitte partners for a more favourable position or watered down position.” This was in addition to the ‘watering down of views’ that already happened internally at Deloitte, in the first instance. 4. The whistleblower claims that, in the past three years, Deloitte discovered enough facts that would have qualified the report. However, a specific audit partner (name withheld by Moneylife) would hold close-door meetings with IL&FS’s senior management and find ways to ‘manage’ these by relying on management explanations and opinions. The whistleblower goes on to outline how Deloitte benefited from these compromises. According to the whistleblower, Deloitte employed a senior tax adviser (name withheld by Moneylife) at a very high salary “to ensure that he would continue to earn high revenues for Deloitte.” He helped design complex tax structures that would meet the ‘eye of the law’ while Deloitte would be protect itself through management explanations. Worryingly, the whistleblower says that since the collapse of IL&FS, the team at Deloitte has been “involved in a massive cover up and creating paper trail.” He goes on to suggest how investigators can unearth the involvement of Deloitte’s top brass. Accessing internal mails of select persons and checking their e-calendars for meetings that were not officially minuted. Confirming internal revenue targets for fees earned from IL&FS group. Checking non-audit and consulting fees billed by Deloitte from IL&FS group, its associates and especially its joint venture partners. Questioning audit team members dealing with IL&FS. The question is: Is the government really serious about a clean-up? So far, everybody connected has been treated with kid gloves. The government-appointed board of IL&FS commissioned Grant Thornton to conduct a forensic audit of IFIN (Project Icarus) which came up with a shocking interim report detailing outright fraud, mismanagement of funds, capricious actions and total disregard for regulators and regulation by the previous management. It also narrowed down the responsibility to the committee of directors (CoD) comprising: founder and former chairman Ravi Parthasarathy, former vice-chairman Hari Shankaran, director Arun Saha and IFIN’s former managing director, Ramesh C Bawa. Even this has not led to any decisive action other than issuing a few show-cause notices. What is worse, some very close friends of this cabal have been appointed by the government to head the new management. The Institute of Chartered Accountants of India is also investigating the role of all auditors and its interim report has already accused them of acting in a ‘fraudulent and negligent’ manner. The Deloitte whistleblower has only confirmed that this was the result of a deliberate nexus with the auditor and for financial benefit. 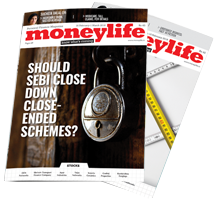 Moneylife wrote to Deloitte’s India CEO (chief executive officer) Punit Ranjen for his comments. A PR (public relations) agency for the audit firm sent us this reply on behalf of Deloitte. We shared the whistleblower’s letter with Claire Hassett, managing director, Deloitte Global Communications who, in turn, appears to have shared it with senior management in India. There has been no further response from Deloitte. We have also shared the whistleblower’s letter with Uday Kotak, now the chairman of IL&FS, and with an official of the Serious Frauds Investigation Office (SFIO), which is investigating IL&FS, as well as other Central government agencies. The independence of rating agencies and statutory auditors is critical to keep a check on malpractices of borrowers. If rating agencies and auditors were not derelict in their duty, the shenanigans of IL&FS would have been discovered much earlier. The loss to lenders could be well in excess of Rs30,000 crore. More importantly, if the checks & balances in a system—provided by ratings, audits and inspections (by the RBI in this case) fail—then all investment decisions become like a lottery. If that is the basis on which we are forced to invest, why has the government spent so much money on creating five giant regulatory organisations for the financial sector alone? Unless those responsible for allowing the IL&FS mismanagement to continue for years are booked, what kind of message are we sending to investors and the people? Unless such INDIVIDUALS, whether in individual capacity or in the capacity as PARTNERS of an ENTITY are put behind the bars at least for a few years such White Collar Thugs will not reduce in number. ILFS frauds didn't originate from Gujarat. It started in Mumbai. Gujarat state has an office of ILFS like it's other offices. You are doing tremendous service by exposing these branded Auditors. Earlier in Satyam Case PWC has been banned. Unless Deloitte is more powerful and more capable to hide its acts of connivance, it should find the same fate. PWC was not banned but it's two partners ( most of the auditors who join become partners as per US parlance)were banned. PWC used it's clout (it may mean anything from money to influence)and got itself exonerated. ICAI , auditors regulator, just remained a mute spectator. Deloitte is quite aware of Indian regulators' strengths and weaknesses. So it doesn't bother about its misadventures. At the most one or two guys may become the sacrificial goat (s). In my opinion I think all the Audits done by the BIG 4 firms are fudged , Audits certificate today benefit the management , help the promoter's and cheat the shareholders or public at large , not only that but these firms are a gang also for insider trading information based on which positions are taken on the stocks in cash and F&O markets . There should be revamp of the whole structure of the compliance and audit of the books of accounts with full fraud detection alarm and rewarding those who blow the whistle. Also all the Audit firm should be banned immediately and wound up for negligence in their working and professional misconduct including PWC , EY , KPMG. Meanwhile for ICAI should be done away with new mechanism for Auditor just like MCI was wounded up due to corruption. For few year's Indian institution for Auditor should be given to CPA (US) or ICEW or CIMA till new mechanism is in place. Going by Indian track record of action on whistle blowers red flag and investigation and action there on is never taken to logical end. No one has ever been punished and not a pai has been recovered. On the contrary heavy sum is spent on investigation and court room procedures. Yet another reason to have bank transaction tax on non corporates as suggested by Dr Swamy again and again. I fail to see the link. Do you do this often? Use random pieces of news to push your own economically illiterate agenda? BTT is the worst idea anyone has had in a long time. It is inherently regressive (because smaller transactions will face a higher proportionate burden) and will discourage people from using banking channels. What better way of encouraging banking than providing a financial incentive to resort to non-banking channels? What’s new... all the audit firms do it and at times the regulators bend backwards to encourage such fraudsters. The Cadbury tax evasion is a classic case.. they created a phantom factory to claim tax exemptions.. fake audit reports and what not; Matter to heard in CESTAT. The time is probably overdue for issuance of directions by Govt of India prohibiting companies retaining Deloitte for audit of their accounts. The Institute of Chartered Accountants of India and Shareholder Associations ought to make an immediate representation to the Govt of India in this regard. Company pays Auditors to audit it books. If Auditors do their job and bring out irregularities they may lose the business. Whats their incentive to do true auditing? No shareholders directly pays auditors. It is the management who pays auditors. Deolliot is one of the big five auditors. Massive frauds in financial sector are due to "no fear" environment in India. Further the judiciary and committees take their own sweet time to get into action. None knows who is shielding whom. ILFS is a case of financial misdoings during the last 20 years. It is difficult to trace the fraud trails and certain king pins would have died, resigned, or retired. Top guys who are in the control regime during the last 10 years would have ring fenced themselves. ML is doing it's fine job of investigations. Keep it up. What else we poor readers can say? Unfortunately auditors have always got away with little or no punishment when the company is found to have committed fraud. The exception was Arthur Andersen in the Enron scandal when the firm went into bankruptcy and ceased to exist. It seems the US govt was so shocked by this outcome that ever since then it has tried to shield auditing companies from such a fate. The same can be said of the credit rating agencies like S & P who rated the subprime mortgages as triple A leading up to the financial crisis of 2008. All these rating agencies should have been fined heavily but that did not happen. Total outstanding debt of fraud-hit Infrastructure Leasing and Financial Services Ltd (IL&FS) group is Rs99,354 crore and not Rs91,000 crore as being stated. 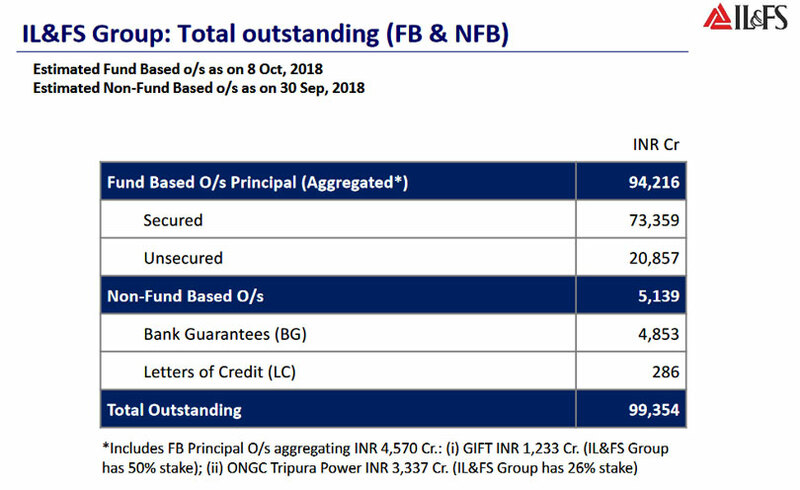 This includes fund based outstanding principal of Rs94,216 crore and non-fund-based outstanding, including bank guarantees and letters of credit of Rs5,139 crore, says IL&FS group in its presentation. In the fund-based dues, a total of Rs4,570 crore in principal outstanding includes Rs1233 crore towards Gujarat International Finance Tec-City (GIFT City) where IL&FS has 50% stake, and Rs3,337 crore towards ONGC Tripura Power Ltd, where the group has 26% stake. 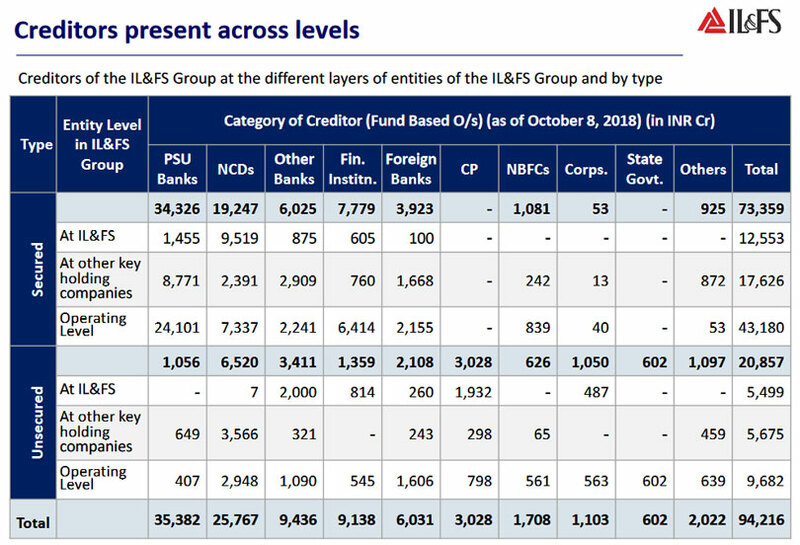 IL&FS group has creditors across its different layers of subsidiaries. Out of its total outstanding of Rs94,216 crore to creditors, Rs73,359 crore are secured debt while rest Rs20,857 crore is unsecured debt, the company says. 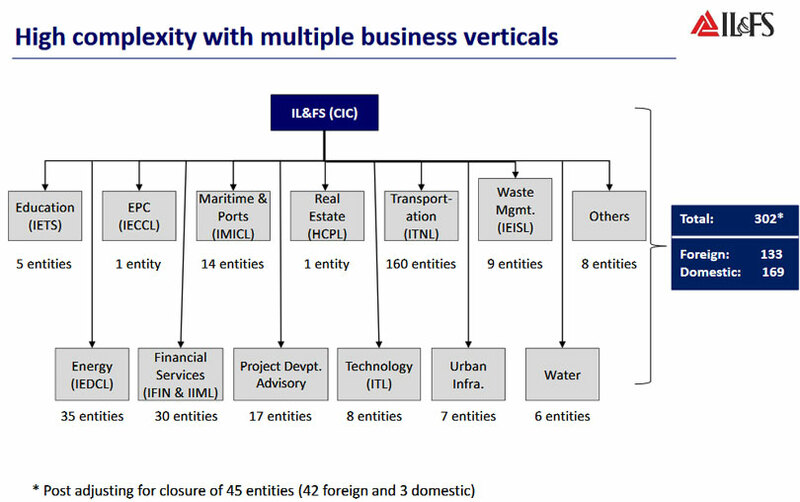 Talking about the highly complex structure across the IL&FS group, its presentation admitted that the board requires time to comprehend, develop and implement resolution plans for these entities. Originally, there were 347 entities in the IL&FS group as identified by the new board. Out of this, 45 entities, including 42 foreign and three domestic units were closed, leaving the IL&FS group with 302 units that include 133 foreign and 169 domestic companies. IL&FS group has maximum (160) number of subsidiaries in transportation, followed by energy sector with 35 and financial sector with 30 entities. 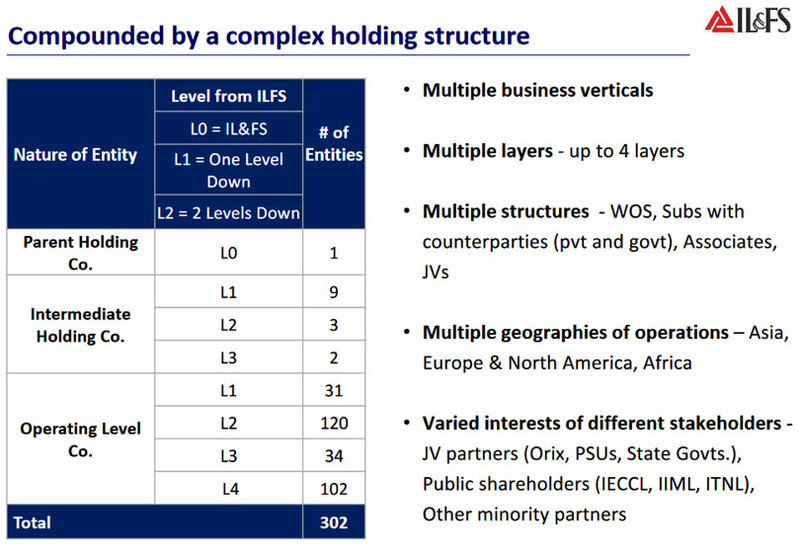 In addition, the IL&FS group has a complex holding structure with multiple layers. So far the new board has identified four layers in the group. IL&FS group has several wholly owned subsidiaries (WOS), subsidiaries with counterparties, including private and government, associate companies and joint ventures (JVs). Its JV partners include ORIX Corp of Japan, which owns 23.54% stake in IL&FS, public sector units (PSUs) and several state governments as well as listed companies. According to IL&FS presentation, the new board headed by Uday Kotak is appointing advisors and securing a moratorium order from third party actions for creating a calm period. "To protect stakeholder interests, we are developing a resolution framework for managing unprecedented group insolvency using the umbrella resolution approach that is built on principles analogous to IBC. This includes resolution plan for international entities, assessment of resolution options, kick starting and monitoring asset monetisation process, subject to approval from NCLT and supervision of Justice (retd) DK Jain," the copmany says. These companies are made to funnel the investments of poors into their own bank accounts.Ilfs director is an IIMA graduate.Maybe they should award him with distinguished alumnus award. What is the meaning of 'secured debt '? When there are no assets. It now appears that as much as 90% of the loans advanced by IL&FS Financial Services Ltd (IFIN), the lending arm of the infrastructure conglomerate, Infrastructure Leasing and Financial Services Ltd (IL&FS) have turned bad. This again underlines the deep corruption and culpability of the previous management. Of its loan book of Rs18,805 crore, Rs10,656 crore was lent to third-party borrowers and nearly Rs7,000 crore to group companies, N Sivaraman, chief operating officer at IL&FS group, has revealed. According to Kaushik Modak, who now heads IFIN, the company has recovered Rs931 crore since the new board led by banker Uday Kotak took over the IL&FS Group. According to a senior banker, before funding, the lenders are supposed to analyse qualitative and quantitative parameters and sanction the debt only if these are satisfactory. The qualitative parameters are credentials of the management and organisational team plus comprehensive risk identification and mitigation. Bankers are also supposed to use “quantitative parameters such the borrower's ability to bring the equity - fresh or through operating cash flow, and viability - standalone and overall. The lender cannot forego this due diligence and rely on credit rating. Post-sanction, there has to be intense monitoring of the fund use during project construction and operations, thereafter,” he continued. “All of this applies to special purpose vehicles (SPVs), setting up project or to infrastructure financing companies, which raises funds for downstream investments in SPVs. If a finance company is funding projects, it has to undertake strenuous due diligence as above,” he added. Amazingly, mutual funds, which are supposed to channel retail investors’ money into safe debt, have put the corpus of fixed maturity plans into IL&FS related debt paper. “This is a stunning commentary of their complacency and negligence. There should be claw back on hefty packages which find managers draw,” he suggested. Unfortunately, given the mood of elections and slow process of establishing negligence and criminality, it is unlikely that any banker will be caught in what is turning out to be one of the biggest financial scandals of India. This is mother of all ghotalas. All those bureaucrats ; nobody would call them fool now. Even subprime mortgage in 2008 USA probably was not that bad. Now two questions are : who were the beneficiaries and how much each got ? How many schools,hospitals etc could have been built with that money ? This is nothing new. We know how corruption was breeding throughout congress ruled decades. In UPA II days it reached post doctoral levels. And now with NYAY scheme there will be more corruption. Local authorities will certify on payment of a percentage that so and so has no income or income per month of much less that 12000/-. How will the scheme identify who is the poorest. A road side resident has no document no residential address or voter card or aadhar card and is the one who needs the funds. This applies even to schemes of BJP. So all this is politics and election funding.